Melbourne loves a bar-bottleshop hybrid. Pioneered here by the likes of City Wine Shop and Gertrude Street Enoteca in the 2000s, the bar-bottleshop's habitat was once restricted to the inner city. But the genius of the idea – drink wine while you're shopping for wine – meant it was always destined for wider appeal. Versions of the species are now found across the city. The latest is Luxsmith Bar in Seddon. Neighbour and sibling to pan-Asian local diner Luxsmith, Luxsmith Bar plays it as straight and simple as its name suggests. Polished concrete floors, whitewashed brick walls, a timber-topped bar with broad-seated bar stools, banquette seating in the windows that wrap around the corner location and an obligatory smattering of indoor plants tick a lot of Melbourne hospo design boxes and give the room an immediate and comforting familiarity. Elegant metal wine shelves are the room's standout design feature. 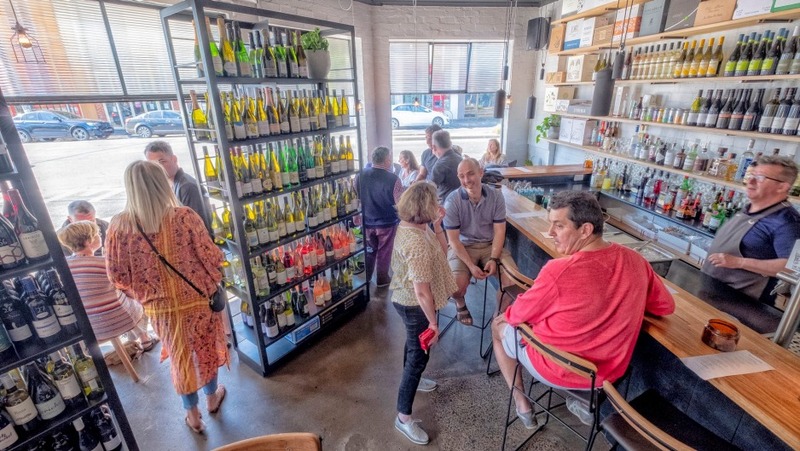 Multi-tasking as partitions, they divide the shopfront room into intimate seating areas as efficiently as they display wine, all of which can be bought to take away or to drink in for just $15 on top of the retail price. Wine is the centre of attention here, though a tightly focused list of cocktails will attract their own crowd. There's not too much mucking around with multiple ingredients or time-consuming technique but plenty of thought has gone into flavour and balance. 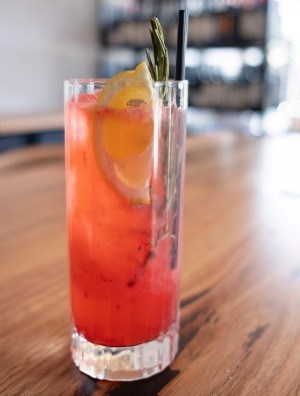 Front-runner for signature drink is the Raspberry Beret, a deep pink joy that brings together Monkey Shoulder whisky, amaretto, Grand Marnier, lemon and raspberries in a highball glass heaped with ice and garnished with a sprig of rosemary. It's refreshing and pretty, with the amaretto's marzipan backbeat really sealing the deal. Given Luxsmith Bar is a watering hole fully conscious of current bar trends, it's not shocking to see a spritz on the cocktail list. This one is a delicious and refreshing take on the classic, with elderflower liqueur, lemon, grapefruit and soda joining the prosecco. The wine list here keeps things easy drinking and geographically democratic. The by-the-glass list gives a good indication of what's on the shelves as South African chenin blanc (Secateurs) rubs shoulders with Italian pecorino (Umani Ronchi) and Mornington Peninsula chardonnay (Garagiste), and sangiovese from Beechworth (Fighting Gully Road) sits alongside Spanish tempranillo (La Vendimia). Those after anything super funky or skinsy might need to look elsewhere but you'd have to be pretty insufferable not to find something to like on this list. The snack game is slight. 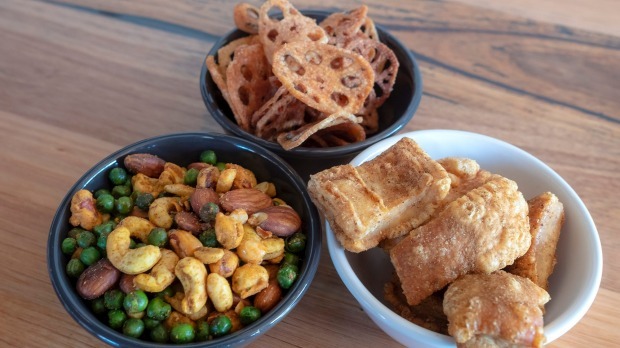 There are just three – nuts, scratchings and lotus root chips. In a nod to its sibling, all have some form of Asian spicing (chilli salt, five spice) but if you're after something more substantial, next-door's country-hopping menu – spring rolls, sashimi, massaman curry, steamed crab bao – is an easy option. Luxsmith Bar is not the only hybrid in the village. It shares turf with Seddon Wine Store, just around the corner. But given the popularity of the bar-bottleshop genre, peaceful co-existence is the likely outcome. Seddonites should be well pleased. The entry-level version – Tanqueray gin and Noilly Pratt vermouth ($19) – does the trick, though a little more chill would be good. Can be customised via a solid selection of gins. Go-to bar snack Chilli salt lotus root chips, $8. Open: Wed-Thu 4pm-11pm, Fri 4pm-midnight, Sat noon-midnight, Sun noon-11pm.